Did you know that Spanish is the native tongue of 470 million people around the world, the second most commonly known language by number of speakers (after Mandarin Chinese) and the third most used language on the internet? According to the yearbook El español: a living language, a 2015 report, published by the Cervantes Institute, Spanish is the second most used language on Facebook and Twitter, and in predominantly anglophone cities such as London or New York. In fact, there have already been calls for the United Nations to exchange French for Spanish as its second official language. The report dedicates a chapter to the United States, where more than 54 million Spanish speakers reside (around 75% of Hispanic families speak Spanish at home), and how Spanish is “by a wide margin” the most studied language. This relates to the economic improvement of the Hispanic community, which has several means of communication in its native tongue and a major publishing network. Did you know that, in the United States, the number of university students enrolled in Spanish courses exceeds the total number of students enrolled in any other language curriculum? This might be because today’s labor force rewards the ability to communicate indistinctly in both English and Spanish. Being bilingual is something that matters to us here at La Voz as well. Over the past couple of years, the Vassar English Language Learners Outreach Program and La Voz have come together in order to put on Poughkeepsie’s Annual Spanish Spelling Bee. Due to the past success of this event, as well as the positive impact it had on students, families, and the community, we are happy to announce that we are planning for Poughkeepsie’s Third Annual Spanish Spelling Bee. Promoting bilingualism in young students has been proven to support overall academic success, as well as provide important cultural connections between the schools and families. We at VELLOP and La Voz understand how difficult it is to maintain bi-literacy when receiving English only education. Despite the vast numbers of Latino/as in the Hudson Valley, English Language Learners often express feeling silenced between the school’s emphasis on English and the distance from their families’ cultural and linguistic heritage. Following the commitment made by VELLOP and La Voz for linguistic cultural traditions, the Spelling Bee aims to empower young students to maintain and develop their mother tongue. By holding this event, our goal is to honor these great students and celebrate their linguistic heritage: Spanish. 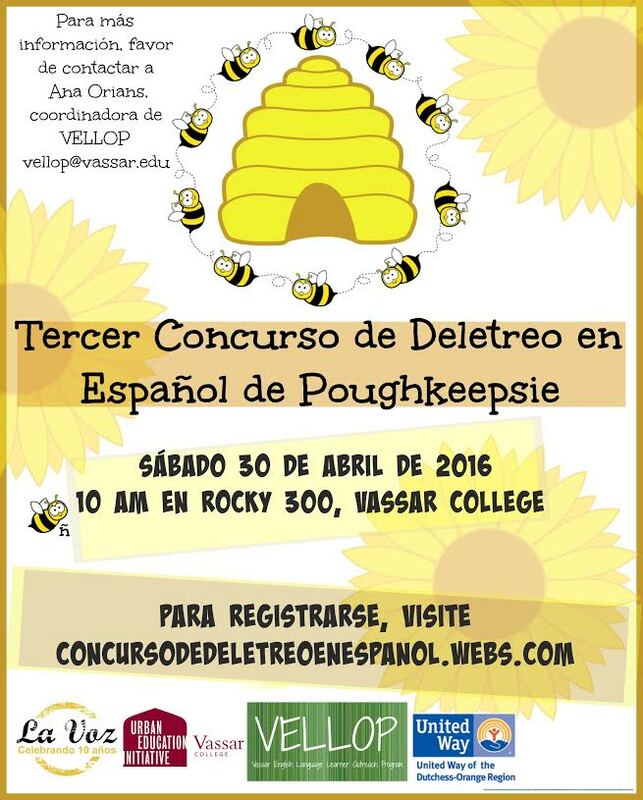 The Spanish Spelling Bee will take place at Vassar College on Saturday, April 30. Middle schoolers, grades 4th though 8th, will be invited to compete against one another to reign as one of two champions of the Third Annual Spanish Spelling Bee. The winners in both categories (4th through 6th grade and 7th through 8th grade, respectively) will receive the grand prize of an iPad. There will also be gifts for all the brave participants. We encourage students to sign up soon (concursodedeletreoespanol.webs.com), and we invite everyone to attend our fun free weekly practices. Every Saturday in March and April from 11 a.m to 12 p.m. we meet at the the Kingston Library (55 Franklin st.), and 12 to 1pm at the Vassar College Library (Poughkeepsie) to practice words for the contest and review aspects of Spanish orthography. Do you know what having a foreign accent means? It is a sign of courage! Comentario: What a great idea....a way to honor the family''s language and a way for parents to engage in their child's learning.